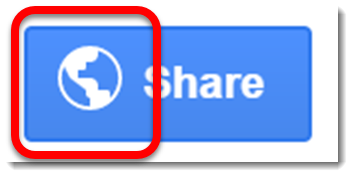 If you use Google Docs (and Sheets and Slides), you've most likely used the ever present blue "Share" button quite a bit. 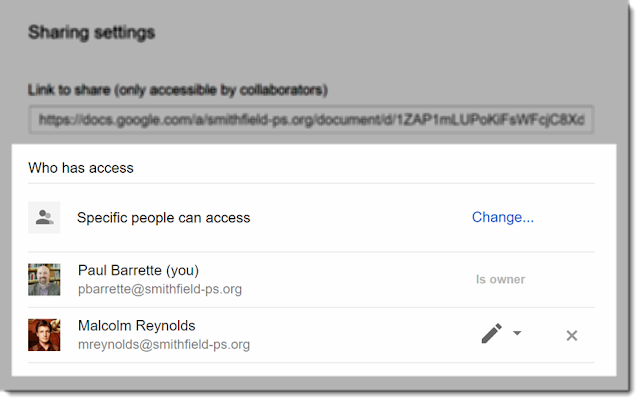 Sharing a Doc, Sheet, or Slide allows you to easily collaborate with others or simply share information. However, it's important for ALL staff to be careful and mindful not to share confidential or sensitive information with anyone that does not have a legitimate need (and legal right) to have access to it. Did you know that the icon that is displayed on the blue "Share" button actually can give you a good overview of if and how widely a Doc, Sheet, or Slide is shared? If a "padlock" icon is displayed on the "Share" button, the Doc, Sheet, or Slide is not currently shared with anyone. 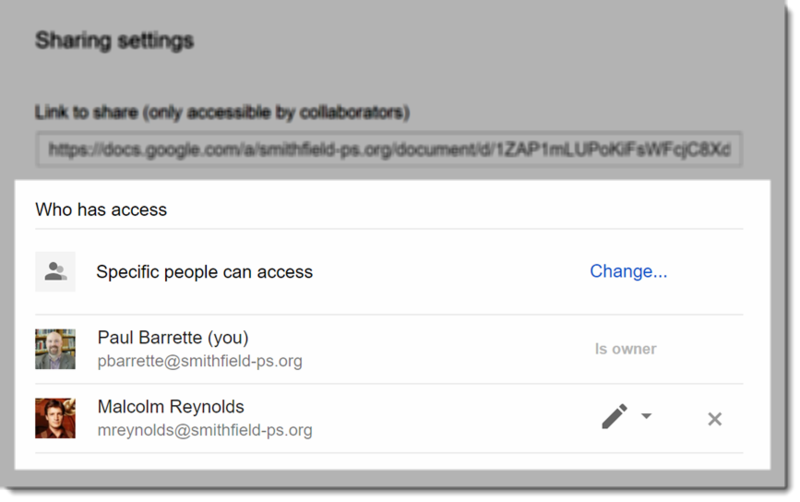 This is the default for all newly created Docs, Sheets, and Slides and is the most private and secure option. This is how it looks in the "Sharing settings"
If a "people" icon (two heads) is displayed on the "Share" button, the Doc, Sheet, or Slide is currently shared with specific people (or a specific person). The creator of the document must make a purposeful decision to share it with specific people by clicking the "Share" button and entering their email addresses. 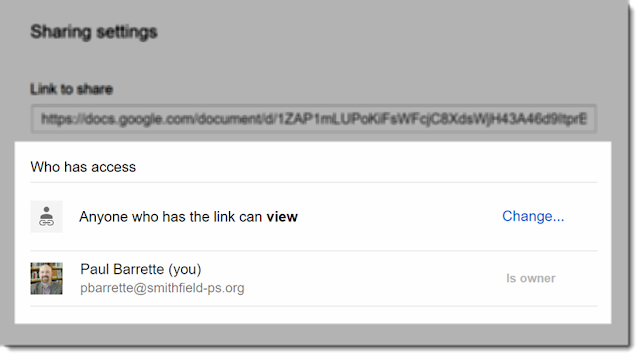 The specific people have either "View", "Comment", or "Edit" access, depending upon the level given by the document creator. This is the ONLY secure way to share confidential or sensitive information! 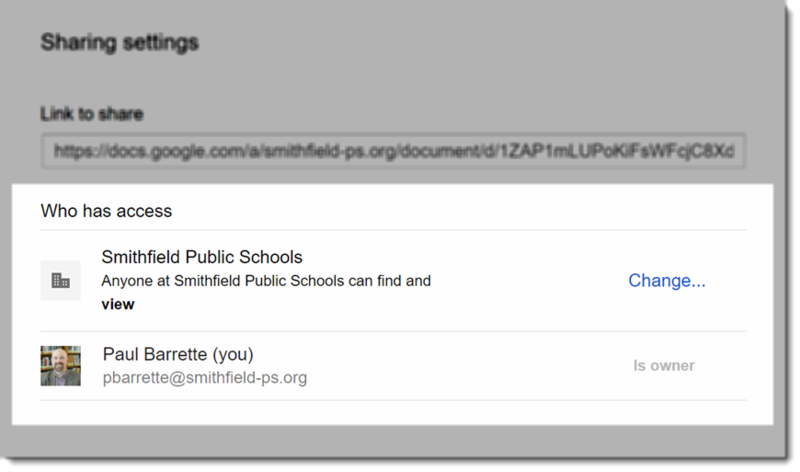 If a "building" icon is displayed on the "Share" button, the Doc, Sheet, or Slide is currently shared with all users within Smithfield Public Schools. This includes Smithfield STUDENTS. 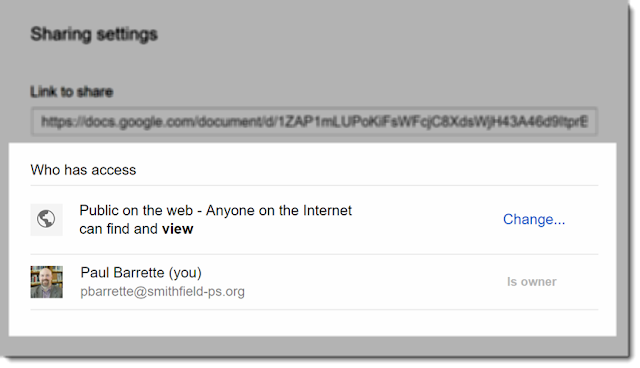 Be careful when using this option and it should NEVER be used with confidential or sensitive information! 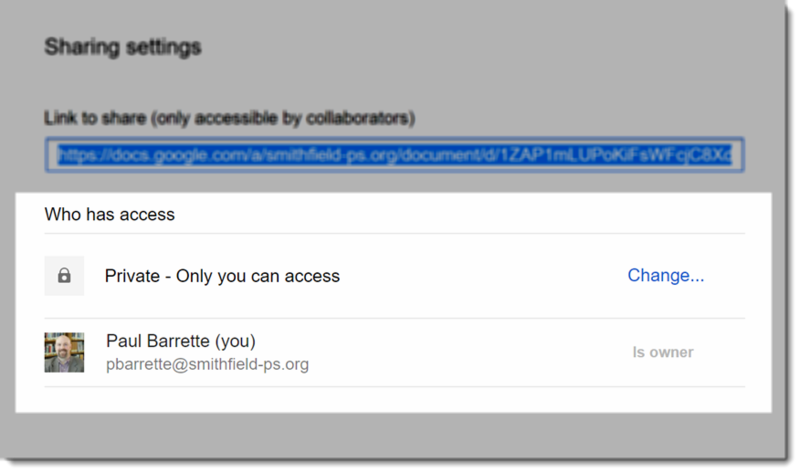 This is a good option for documents that should be accessible for all Smithfield staff and students, but don't necessarily need to be public. 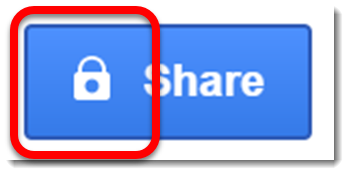 If a "globe" icon is displayed on the "Share" button, the Doc, Sheet, or Slide is currently shared and accessible publicly on the internet. These documents also can be found by using any internet search engine (e.g. Google, Bing, DuckDuckGo, etc.) This option should NEVER be used with confidential or sensitive information! This is a good option for documents that should be publicly available (e.g. open meeting minutes). 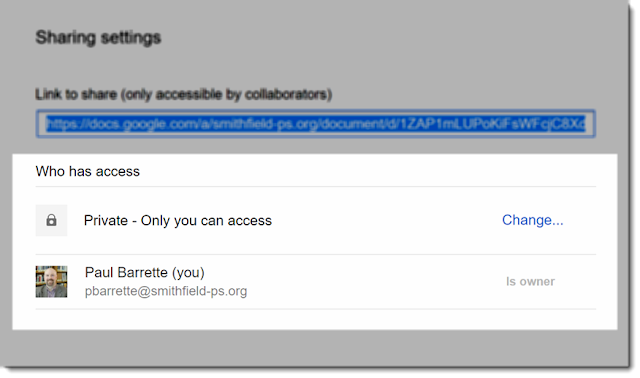 Hopefully, this helps you more quickly identify the sharing level of your Google Docs, Sheets, and Slides. Coming next, a deeper dive into the "Sharing settings" themselves and how you can utilize them.